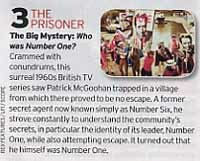 "The Prisoner" TV series often pops up in magazine polls, and this week sees another with the show bagging 3rd spot in The Radio Times' "TV's Biggest Mysteries" poll, for its intriguing "Who is Number One?" conundrum. Top of the poll is "Lost", with the "Who Shot JR?" mysery from "Dallas" in 2nd place. Other shows in the Top 10 include "Sapphire and Steel", "The Simpsons", "Twin Peaks", "The Fugitive", and "The X-Files". With thanks to Roger Goodman for this news item.